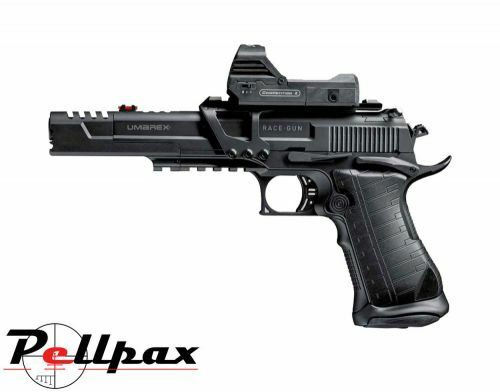 This Race Gun pistol from UX is a high quality, full metal blowback pistol which has been specially designed for International Practical Shooting competitions and has a crisp and clean blowback system, which is backed up by fantastic accuracy. Some of the special features which have been specially built into this pistol are the compensator on the end of the barrel, cocking lever, easy to use safety system and excellent build tolerances to give the gun a really solid feel. This model of the Race Gun comes with the top weaver rail which screws onto the frame, a reflex sight which can be removed, and the standard fibre optic and standard sights which you can fit if required.